Former Italian PM Silvio Berlusconi has written to more than 20 world leaders saying he expects his election defeat to be overturned, media reports say. The magazine L'Espresso has released a copy of one of the letters - confirmed by Mr Berlusconi's office as genuine - written to the Spanish prime minister. He says he hopes an inquiry into what he calls voting irregularities will see him returned to office. His government was defeated by the centre-left coalition of Romano Prodi. Mr Prodi's government was sworn in last week, after winning votes of confidence in both houses of parliament. His narrow defeat of Mr Berlusconi in the April parliamentary election was validated by Italy's supreme court - which confirmed Mr Prodi had won the lower house by a margin of some 24,000 votes. In the Senate, 158 seats went to Mr Prodi's bloc, 156 to Mr Berlusconi's and one to an independent. It was the closest margin in the history of the Italian republic. Mr Berlusconi refused to accept he had lost the election, saying he recognised Mr Prodi had "won the consensus" but insisting his own coalition won a larger share of the popular vote in the Senate. He repeats his views in the letter to Spain's Jose Luis Rodriguez Zapatero. "The coalition that I led wound up in the majority overall in the number of votes, but in the minority in terms of parliamentary representation," he writes. "As opposition leader, I represent 50.2% of the country." He adds: "I hope to return to government soon after more than 1.1 million annulled ballots have been checked. Remember that you have a friend who cares about you. A big hug. Silvio." 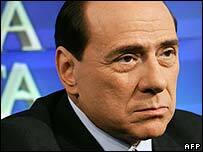 But for the outcome to be challenged, Mr Berlusconi has to persuade parliament's electoral committee to order a review of the spoiled ballots. What next for Italian politics?